See how my paintings come to life! These links will take you to YouTube and will open up in another window. 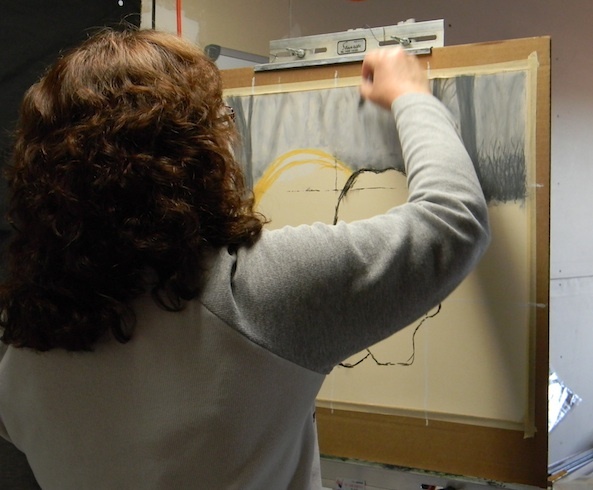 Click on "How To Frame A Pastel Painting" to see this HOW TO video! Click on "Vision of the Wild Prairie" to see this in progress video. Click on "Break Free" to see my painting's in progress video. Click on "Messages" to see my painting's in progress video. Click on "Heartland Path" to see my painting in progress video. 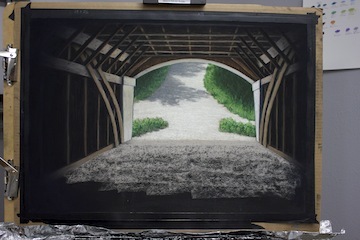 Click on "The Gazebo - Le Mars, IA" to see this painting's in progress video. Click on "Beside Still Waters" to see my painting's in progress video. Click on "Light On My Path" to see this painting's in progress photos in video. Click on "Around the Bend" to see this painting's in progress video! Click on "Long Lonesome Highway" to see this painting's in progress video! 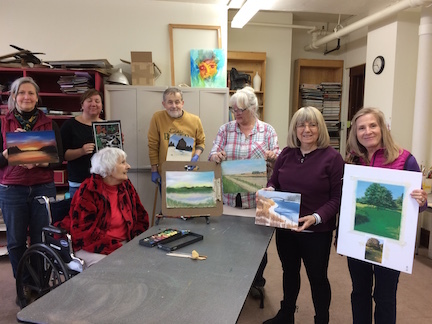 My pastel workshop in Ames, IA at the Octagon gallery. The participants in my workshop and their work for the day! I have wanted to do this one for a long time. the colors above the door. true to the focal point, as things will fade into darkness as it comes forward. move on to the view out of the door. the dark and shadowy interior. I have this at the finished stage, so I will set it aside for a bit. I worked in a few colors and drew in the board separations. I touched up some details here and there and will call it done! Then I will get the finished photo of it posted in a day or so. I am going to paint this very old barn from the 1800's on a 9"x12" Uart paper. I took this photo near my home. As always I start in the upper left corner and work my way down. add highlights, which will bring it closer to me. it will overtake it or destroy it. That will be a sad day. foliage through the lower right window. I will later move on to the foreground. I haven't posted any new paintings in a while, so here is my newest. I am blessed with a great view of sunsets over tree covered hills. I saw this sunset and it called me... I had to paint it. My first step is to layer in the upper sky and clouds. I blocked in some base color on the lower ones. I'll post the next results tomorrow! in the sky before I loose it. Then I will put in the horizon. Continuing to work on the sky. I blocked in some of the color of my focal point. the right and more detail in the "sunset area" next. to the clouds. I have been doing a lot of blending! I will add more color to the clouds and do the foreground next. done and post it in my portfolio page. with a white pastel. Then I started in on the sky and background. I just block in the dark color for the closest background hill. hill and the highlights. Then I started in on the back area of the water. I also tweaked the sky a little bit more. In my painting session today, I added in more of the water, working my way forward. Then I started in on the heads of the couple and a little on the white shirt. so I don't mess up either one. work on the beach and hopefully finish the couple next time. same color as the paper. I also finished the water and surf line. I may have to tweak the couple a bit more, I'm not quite happy with them. and working my way down and forward. on this one. I am moving through the middle ground area. with the fields. The big trees in the foreground will be next. Here's the final painting session. I got it done today. I'll live with it for now to see if there's anything to tweak. I still haven't named it yet. I'll come up with something before I put the finished photo on my website. This painting went on to win an Honorable Mention in the Artist's Magazine in 2014 and is now sold!